We propose a framework for efficient OLAP on information networks with a focus on the most interesting kind, the topological OLAP (called “T-OLAP”), which incurs topological changes in the underlying networks. T-OLAP operations generate new networks from the original ones by rolling up a subset of nodes chosen by certain constraint criteria. The key challenge is to efficiently compute measures for the newly generated networks and handle user queries with varied constraints. Two effective computational techniques, T-Distributiveness and T-Monotonicity are proposed to achieve efficient query processing and cube materialization. 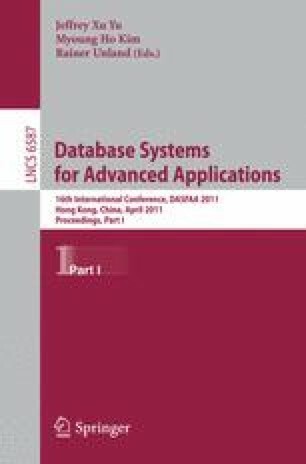 We also provide a T-OLAP query processing framework into which these techniques are weaved. To the best of our knowledge, this is the first work to give a framework study for topological OLAP on information networks. Experimental results demonstrate both the effectiveness and efficiency of our proposed framework. This work is supported by Natural Science Foundation of China (NSFC) under grant numbers: 60973002 and 60673113.